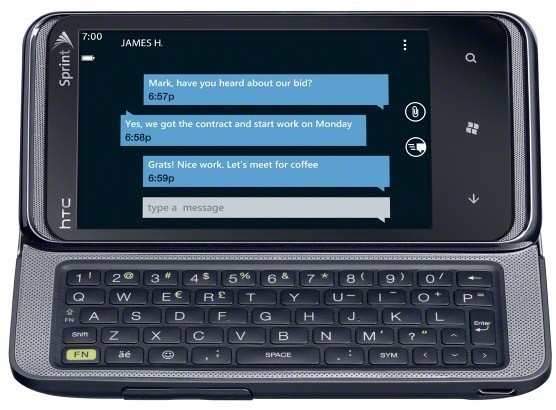 "Sprint picks up the QWERTY tilt-o-matic this coming March 20th for $199.99 on a two-year contract after $100 mail-in rebate, featuring a 3.6-inch WVGA display, 1GHz Snapdragon processor, 5 megapixel camera with flash and 720p video capture, 16GB of internal storage, and 802.11b/g/n WiFi." If you are one of the millions of people that have been waiting for Windows Phone 7 to "arrive" on the Sprint network, wait no longer! The HTC Arrive will be here very soon. Sprint has finally given us an official launch date and price. Check it out here. Hopefully they will be adding several more devices in the near future to give a little variety to their Windows Phone offerings. But this is a great start. Ok Verizon, now it's your turn! Now if someone would invent a time machine so that March 20th would get here sooner.